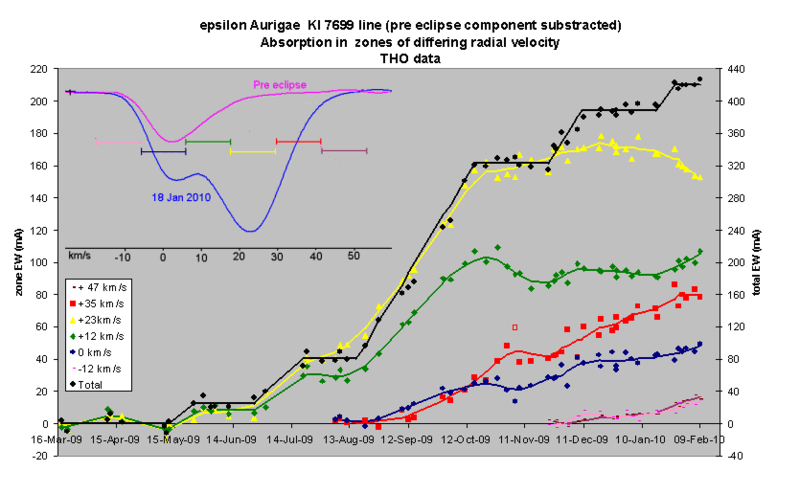 Every 27 years Epsilon Aurigae is eclipsed by a strange extended object, the exact nature of which is poorly understood. 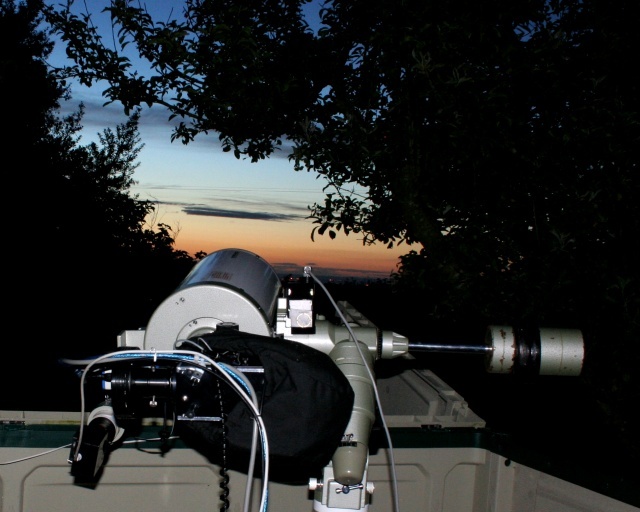 The eclipse 2009-2011 will be closely studied by amateurs and professionals alike. In particular it will be the first time that amateurs equipped with high resolution spectrographs will be able to contribute. I will be posting some of the spectra I record during the campaign on this page. 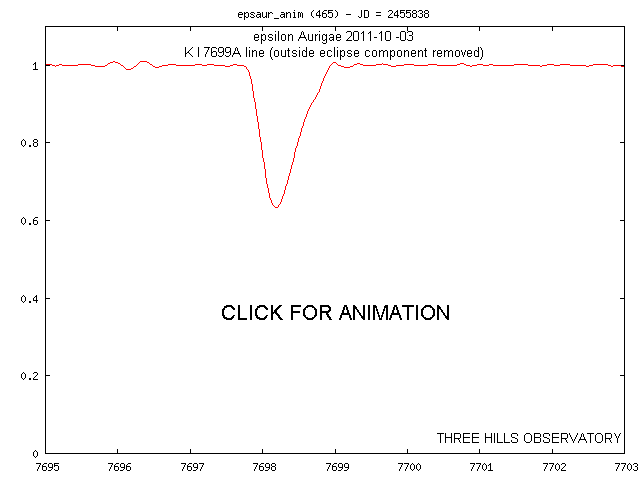 Although the eclipse ended photometrically in May 2011, the extended atmosphere of the eclipsing object continues to be visible in the spectrum. The AAS 217 Seattle meeting included oral and poster sessions on epslion Aurigae. 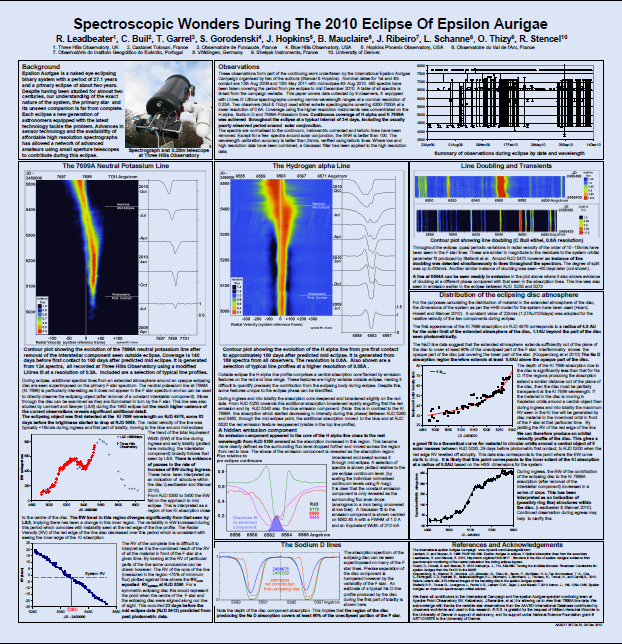 The poster below was presented covering the amateur spectroscopic observations to date. 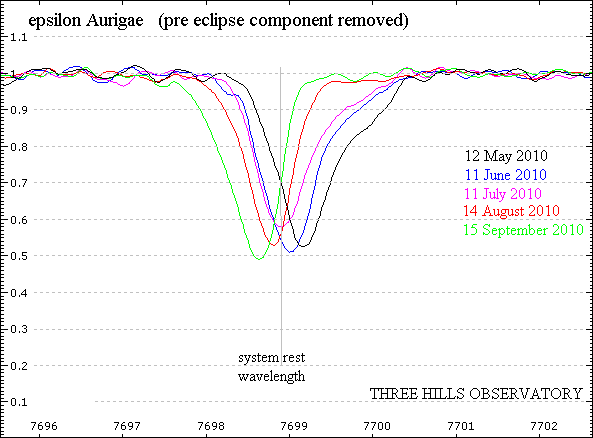 Based on past photometric data, mid eclipse from was predicted to be 4th August 2010. If the system was perfectly symmetric, this would be the date when the F star and the centre of the eclipsing disc would lie directly along our line of sight and the radial velocity (RV) of both components would be zero relative to the radial velocity of the complete system (~ -2km/s from published orbital solutions) If the eclipsing disc disc is symmetric we should see equal amounts of material with red and blue radial velocities at mid eclipse so the KI absorption line (after removal of the interstellar component) should appear symmetric about the system rest wavelength. The line shifted from the red to the blue side around mid/late July 2010. The line profile appeared most symmetric around 25th July . By plotting the RV of the line we can estimate when the RV of the eclipsing body matched the system RV. For the complete line this was on or around 17th July, though the scatter is large due to variations in the high velocity components in the wings. Measuring the RV of the narrow core of the line may give a more accurate indication (scatter is very low at typically +-1km/s) This matched the system RV on or around 12th July. Note that the point where the two lines cross (27th July) is the point when the line is most symmetric. 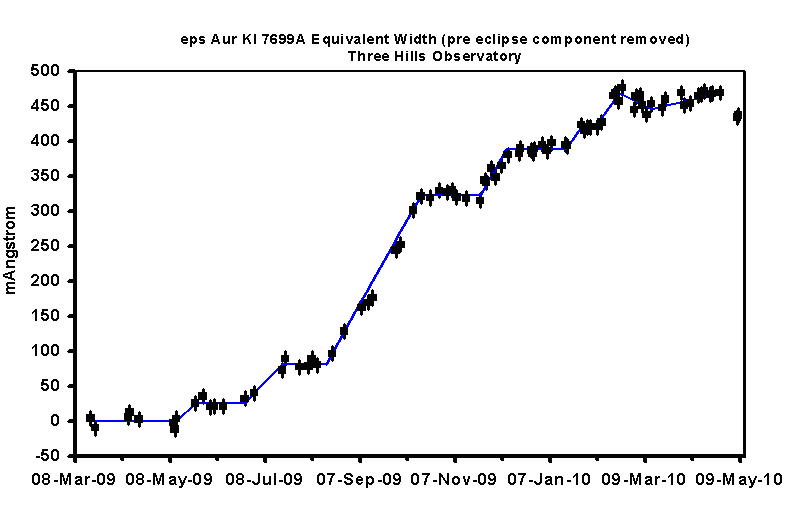 Comparing the total line strength (ie including the out of eclipse component) with results from Lambert and Sawyer last eclipse we see that the descent to the minimum around mid eclipse was more gradual during this eclipse. The strength is now increasing again but perhaps delayed by ~15 days compared with last time. The equivalent width of the KI 7699 line levelled off on 18th February 2010 but the line profile continued to evolve with the core of the line moving to the blue. Click here for an animations and false colour plot showing the evolution of this line. The latest observations 7th and 8th May show the line intensity dropping currently. 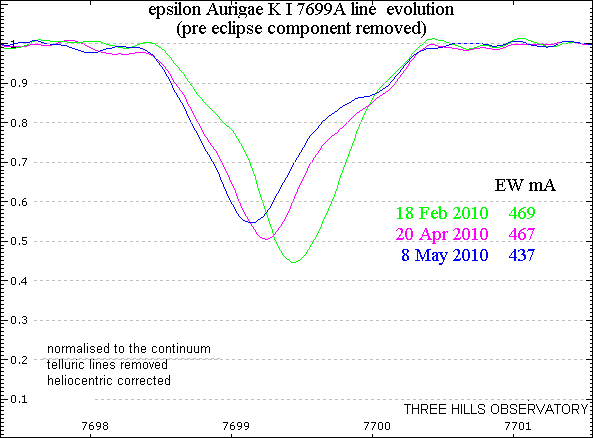 8th May 2010 is the predicted date for the start of the expected mid eclipse brightening. Photometrically the light curve has flattened off, indicating that the densest part of the eclipsing object now stretches across the F star and the second contact point of the eclipse has been reached. The more tenuous outer regions of the eclipsing object however (as tracked for example by the additional absorption in the K I 7699 line) have been spread across the width of the eclipsed star for some months now. As a result, the changes in the K I 7699 line have become more subtle since November 2009. Although the Equivalent W idth has continued to increase overall, the changes have been more at the edges of the line profile with little increase in the maximum absorption. This may be explained if the eclipsing object is a rotating disc in Keplerian motion. 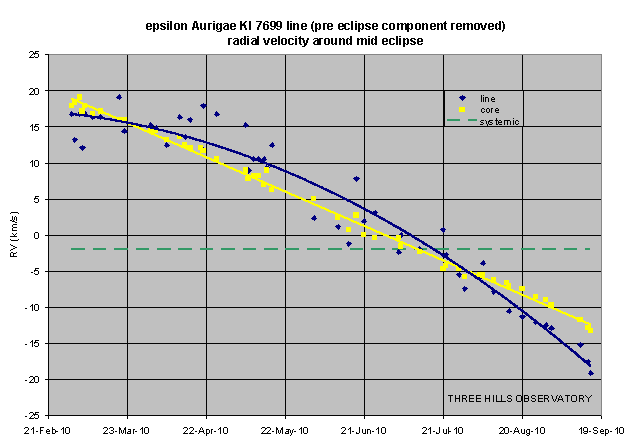 a) As the eclipse progresses, an increasing proportion of the rotating disc in front of the star is moving almost transversely relative to our line of sight and so shows little doppler shift due to the rotation. This produces an increase in absorption around the KI rest wavelength, currently at the blue edge of the absorption line profile. b) The inner regions of the leading half of the disc are now moving in front of the star. These are rotating faster than the outer regions now moving off the far edge of the star and the net result is an increased radial velocity red shift. 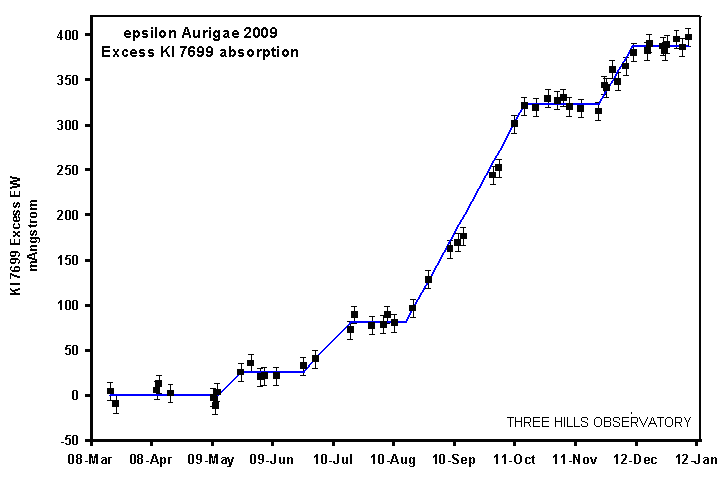 The intensity of the additional absorption in the KI 7699 line has now reached 400 mAngstrom equivalent width, similar to the value seen at this stage by Lambert and Sawyer during the previous eclipse. KI 7699 EW data and line profiles from Three Hills Observatory were included in this poster paper presented at the 110th AAS meeting Washington DC January 2010. 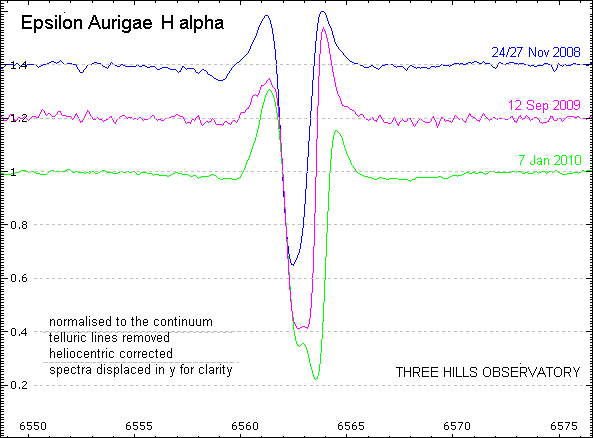 The THO results are in good agreement with those obtained using the 3.5m ARC telescope and ARCES spectrograph at APO as shown in fig 7 of the paper. 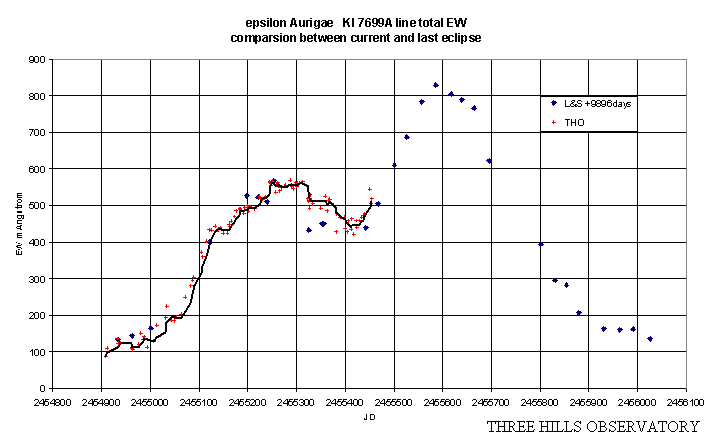 Identifying changes in the Hydrogen alpha line due to the eclipse is complicated by variations seen in this line outside eclipse (both in the absorption core and in the red and blue emission wings). The emergence of an additional absorption component during ingress to the red of the out of eclipse absorption core is clear however. 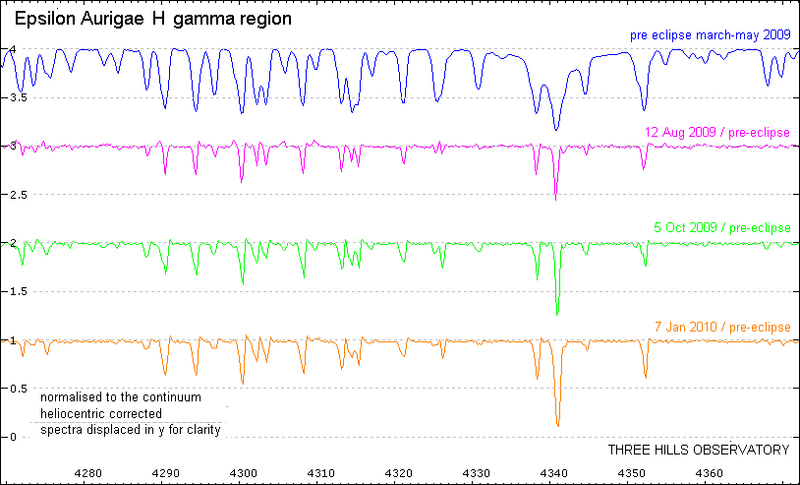 During ingress the H gamma line in the shell spectrum has increased significantly in intensity, the other features less so. 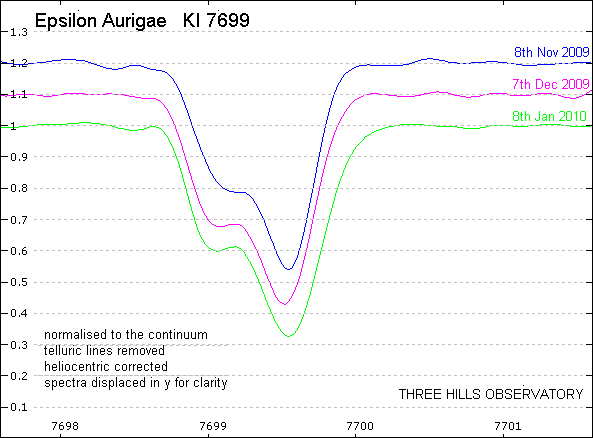 Note also the absence in the shell spectrum of some lines present in the pre eclipe spectrum. The Ti II line at 4331A is a good example.